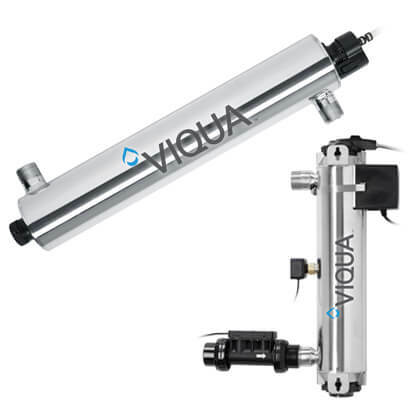 Viqua Sterilight Ultraviolet UV Disinfection Systems | Applied Membranes Inc.
Point of Use Ultraviolet Disinfection Systems for installation at a single tap (or faucet) within a home, cottage or business. TAP systems are also suitable for fountains or low-flow applications (1-4 gpm). Point of Entry (Whole-House) Ultraviolet Disinfection systems for homes and small businesses. VIQUA UV MAX Professional Plus NSF Certified Commercial Ultraviolet Water Purification Systems. For NSF Certified Disinfection up to 30 GPM. Specifically designed for vending & dispensing machines, VIQUA VENDING Series incorporate a separate reactor vessel and ballast, lending itself to installation inside the equipment. 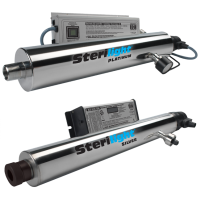 Product support, replacements, and consumables for retired STERILIGHT ultraviolet water treatment systems. Not all water disinfection technologies are created equal. For example, chemicals can be both dangerous to handle and potentially hazardous to the environment – and some waterborne illness-causing microbes are chlorine-resistant. Reverse osmosis wastes on average three gallons of water for every one gallon it purifies, and is no longer recognized as a barrier to microbiological contamination. Filters can improve taste, but they generally don’t treat microbiological contaminants. There is an option that addresses all of these issues: ultraviolet (UV) disinfection. But ours is revolutionary. UV has been used since the early 1900s as a way to eliminate the health threat of microorganisms in water. At VIQUA, we’ve been refining and perfecting the technology for use in homes since the 1970s. Water is disinfected as it runs through a stainless steel chamber containing a UV lamp. As water flows past the lamp, illness-causing microorganisms receive a lethal dose of UV light that attacks their DNA and eliminates their ability to reproduce. Harmful bacteria and viruses are deactivated, and your family is safe! By installing a UV system, you can be confident you’re protected from chlorine-resistant microorganisms, such as Cryptosporidium and Giardia. All water systems can be vulnerable to these microbes given the right conditions. Cryptosporidium is resistant to chlorine and has become a common waterborne disease everywhere. This microscopic bug was responsible for many deaths and widespread illness when it contaminated the Milwaukee, Wisconsin, drinking water supply in 1993, sickening over 400,000 people and killing over a hundred. But not all events are so high profile. Every year, thousands of cases of illness caused by Cryptosporidium and Giardia are documented by the Centers for Disease Control and Prevention (CDC), despite the amazing efforts made to keep our water safe. And according to a recent study published in the United States, as many as 19.5 million cases of illness every year can be attributed to contaminated drinking water. UV water disinfection is a safe, chemical-free way to treat water. Even chlorine-resistant microorganisms are made harmless through UV exposure. Lack of chemicals means no harmful chemical byproducts are going back into the environment, and the taste of your water is not affected in any way. VIQUA’s UV systems install easily into existing water lines and provide clean, safe water to every tap in your house. Our UV systems are also extremely economical to operate. A typical whole home system uses the same power as a 40-Watt light bulb. Depending on the size of the home, the current quality of your water, and your water source, we can provide a system to meet your needs.